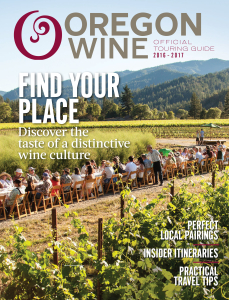 In the winter of 2016 I co-edited the first-ever official Oregon wine touring guide, where I was responsible for FOB content including trend stories, introductory comments, historical timelines, short profiles, recipes and other content. My story "The Future of Oregon Wine" is also available in the digital version. From epic real-life struggle, to computer game, to slightly less epic real-life struggle. Can hiking help connect parents, turn kids into naturephiles and battle PPD? All signs point to yes. The country's birding phenom on Oregon's avian paradises. Moving households is arduous for anyone, but perhaps toughest of all for the American bald eagle. The tiny suburb of Jackson Hole has a Wild West allure all its own. Aurora Mills Architectural Salvage, gluten-free focaccia and a utopian experiment. Columbia Hills State Park cradles some of the Northwest’s most stunning rock art. Novak's. Antique Mall. Monteith House. You gotta go. Shortening days, a flurry of activity in the vines, and an industry at the height of its grape-fueled action make fall a prime season for wandering the Willamette Valley. The storied Oregon State Hospital opens its collections of objects related to mental health for the first time.